For a magazine best-known for jokes and satire, Private Eye - which is celebrating its 50th anniversary - has a remarkable track record in investigative journalism. Since its early days, it has built a reputation for breaking stories that other papers will not print - taking on the rich and powerful and risking expensive libel actions that have threatened to close the magazine down. Those whose misdemeanours have been exposed by the Eye include politicians of all parties, business tycoons, corporations, lawyers, civil servants and media personalities. The stories go back as far as August 1963, when the Profumo scandal was at its height, and the prime minister Harold Macmillan was fighting for his political life. Veteran journalist Claud Cockburn produced a string of exposes about politicians' private lives and espionage. In issue 43 he revealed, among other things, that the prime minister's wife, Lady Dorothy Macmillan, was having an affair with Tory MP Bob Boothby and shattered all protocol by naming the head of MI6. 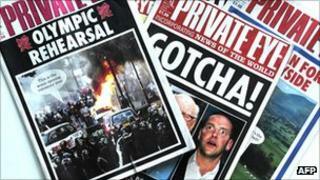 "It was the birth of serious journalism in Private Eye," says Adam Macqueen, author of Private Eye: The First 50 Years. Another key figure was Paul Foot, whose Footnotes section became a byword for exhaustively researched investigative articles which other titles would not print. Foot found the freedom at Private Eye liberating, after writing for newspapers. In a 1976 Radio 4 programme called Private Eye, Public Interest?, he said: "I was drawn to it like a bee to a honeypot. "It's independent of any kind of profit motive or shareholders' interference or advertising pressure. That's very important." In 1972, the home secretary Reginald Maudling was forced to resign over his links with a millionaire property developer, John Poulson, who was involved in a corruption scandal in North-East England. Two years earlier, Foot had revealed that Maudling had once been on the board of one of Poulson's companies, and they were now in financial trouble. But no-one followed it up. "It was our first experience of a familiar pattern," recalls the then editor Richard Ingrams, in Private Eye: The First 50 Years. The Eye had exposed "what looked like a truly sensational story, only for us to find that it was completely ignored by the national press, which only began to take an interest in Poulson when he was later declared a bankrupt". Some think the Eye is at least partly to blame. Its jokey, satirical format - and willingness to take legal risks that others won't - makes it easier to dismiss its stories as unreliable. And, because it rarely seeks to be balanced or give a right of reply, its stories often don't produce results till they are picked up by other media. Not everyone feels they can afford to ignore the Eye. In the 1970s and 80s, tycoons Sir James Goldsmith and Robert Maxwell both tried to close it down with a string of libel actions. Goldsmith even launched a criminal libel case, which could have put the editor in jail, over allegations that he had been one of a group who helped Lord Lucan flee after Lucan had murdered his family nanny. In 1986, the Eye was faced with one of the highest libel awards in British legal history when Sonia Sutcliffe, wife of the Yorkshire Ripper Peter Sutcliffe, was awarded £600,000 in damages. Ian Hislop had just been made editor and famously said: "If that is justice, I'm a banana." Fortunately for the magazine's survival, the damages were reduced to £60,000 on appeal. Some say the Eye no longer breaks stories, or risks legal challenges, as it once did. That's denied by members of the current reporting team, who point to a string of stories where the Eye has been ahead of the rest of the media, from the hugely expensive failures of government computer programmes and private finance initiatives to corporations ripping off the public sector. "The Eye has a tolerance for long, detailed articles about things that seem dull but are very important," says Solomon Hughes, who writes business stories for the Eye and the Guardian. "Being fortnightly helps, in that we're not tied to the same news deadlines as other media - and Ian Hislop likes using journalists from non-traditional backgrounds, who enjoy delving into reports of the National Audit Office and company accounts." Richard Brooks is one. He was a tax inspector for 16 years, and spent a year at the Treasury giving policy advice to ministers. He discovered his own tax office had been contracted out to a Bermuda-based company under a private finance initiative: "I thought: 'Whoa - the bloody tax office is going to a tax haven!" Brooks has been writing regularly for the Eye since 2004, making expert use of the Freedom of Information Act to uncover documents government departments would rather keep secret. Last year, one of his stories about Vodafone's tax liability led to High Street protests (and denials from the company and HM Revenue & Customs). And Private Eye still occasionally finds itself in the law courts, sometimes of its own volition. Earlier this year, Ian Hislop led the battle against super-injunctions, challenging gagging orders taken out by the former Independent editor and BBC political editor Andrew Marr. He said he thought Marr had been "a touch hypocritical", because he'd written an article saying Parliament - not judges - should determine privacy law.